Medicinal use of cannabis in the United States: historical perspectives, current trends, and future directions. Medical Scientist Training Program, University of Washington, Seattle, WA, USA. Cannabis (marijuana) has been used for medicinal purposes for millennia, said to be first noted by the Chinese in c. 2737 BCE. Medicinal cannabis arrived in the United States much later, burdened with a remarkably checkered, yet colorful, history. Despite early robust use, after the advent of opioids and aspirin, medicinal cannabis use faded. Cannabis was criminalized in the United States in 1937, against the advice of the American Medical Association submitted on record to Congress. The past few decades have seen renewed interest in medicinal cannabis, with the National Institutes of Health, the Institute of Medicine, and the American College of Physicians, all issuing statements of support for further research and development. The recently discovered endocannabinoid system has greatly increased our understanding of the actions of exogenous cannabis. Endocannabinoids appear to control pain, muscle tone, mood state, appetite, and inflammation, among other effects. Cannabis contains more than 100 different cannabinoids and has the capacity for analgesia through neuromodulation in ascending and descending pain pathways, neuroprotection, and anti-inflammatory mechanisms. This article reviews the current and emerging research on the physiological mechanisms of cannabinoids and their applications in managing chronic pain, muscle spasticity, cachexia, and other debilitating problems. After reading the above text taken from the national institutes for health information, how can it be that marijuana is still listed as a class 1 drug, which requires for it to have "no medical use?" "A smoker would theoretically have to consume nearly fifteen hundred pounds of marijuana within about 15 minutes to induce a lethal response... In strict medical terms, marijuana is far safer than many of the foods we commonly consume. For example, eating ten raw potatoes can result in a toxic response. By comparison, it is physically impossible to eat enough marijuana to induce death." "Estimates suggest that from 20 to 50 million Americans routinely, albeit illegally, smoke marijuana without the benefit of direct medical supervision. Yet, despite this long history of use and the extraordinarily high numbers of social smokers, there are simply no credible reports to suggest that consuming marijuana has caused a single death. By contrast, aspirin, a commonly used, over-the-counter medicine, causes hundreds of deaths each year." There are several ways to use medical marijuana. Those include, smoking, eating, juicing, and vaporizing. Smoking is one of the quickest and easiest ways to ingest marijuana and surprisingly marijuana has been found to NOT cause lung cancer in a study done by UCLA's Dr. Donald Tashkin . Dr. Tashkin stated, "we found there was no association with lung cancer and even a suggestion of some protective effect," says Tashkin, whose research was the largest case-controlled study ever conducted. The study was funded by the National Institutes of Health. 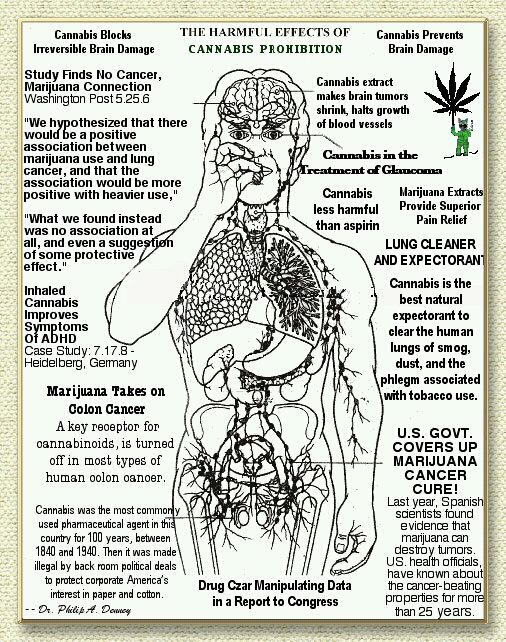 In fact, several studies have indicated that marijuana kills cancer cells without harming surrounding tissue. Brain cancer, breast cancer, lung cancer, and skin cancer have all showed positive response to molecules contained in marijuana. In fact, the Federal Govt. holds a patent on marijuana for its health benefits. The patent number 6630507 is registered to the United States Department of Health. Marijuana has been safely used for thousands of years. The following video shows facts concerning marijuana through history. Medical marijuana is non-toxic, and has been found to be a safe and effective treatment for pain, nausea, arthritis, vomiting, loss of appetite, sleep, seizures, glaucoma, PTSD (post traumatic stress syndrome), Crohn's disease, inflammation, ADD (attention deficit disorder), ADHD (attention deficit hyper activity disorder), wasting syndrome, epilepsy, hepatitis C, autism, stress relief, and many more ailments that medical marijuana provides an effective treatment for. All conditions that medical marijuana can help, may not be included by the State Health Department. It is important to know the law, and what conditions have been approved for use of medical marijuana in your State. There has been an overwhelming demand due to the realization that many potentially toxic and dangerous medicines can be avoided, or reduced by using medical marijuana as an alternative, or in addition to conventional medicine. This has created an overwhelming demand for medical marijuana. To best serve all potential medical marijuana patients, please fill out the form on the MMJ page, so we can contact you, to schedule a time for you to visit with a Medical Marijuana Doctor. All information is confidential and will only be shared with the Medical Marijuana Doctor who is available to answer your questions concerning medical marijuana, and help you incorporate medical marijuana into your treatment plan. Again, please fill out the form on the home page to have your medical marijuana questions answered, or to obtain a recommendation from a qualified physician to use medical marijuana. "There is very little evidence that smoking marijuana as a means of taking it represents a significant health risk. Although marijuana has been used safely for thousands of years, there is just now becoming more and more evidence of the beneficial molecules in marijuana. Recently, with the discovery of the endocannabinoid system, scientists have learned that cannabinoids from marijuana fit perfectly like a key in a lock on receptors in the human body. Our bodies also produce cannabinoids. Currently researchers think that some people may be cannabinoid deficient, which could be a precursor for various illnesses and diseases. There have been instances of significant healing for patients that appear to fit this model. One Doctor in particular has found noticeable improvement in patients who ate cannabis, and also juiced the fresh leaves of cannabis. A normal process in which a cell destroys protein and other substances in its cytoplasm (the fluid inside the membrane but outside the nucleus), which may lead to cell death. Autophagy may prevent normal cells from developing into cancer cells, but may also protect cancer cells by destroying anticancer drugs or the substances taken up by them. Marijuana has been shown to kill cancer cells without harming the surrounding tissue. This is very exciting as no other current cancer treatment can make that claim.